A hackathon, data migration and capacity building – it was a busy month for ICRISAT’s efforts to modernize databases and strengthen breeding data management. Crop breeding programs can be much more effective with modern data management tools. This is just what a workshop series across Africa with National Agricultural Research System (NARS) partners and ICRISAT staff aimed to do. For data management, a week-long workshop in Ethiopia, focused on hands-on training, preparing germplasm data from existing materials in Breeding Management System (BMS). It was a good opportunity for participants to prepare for the season, especially as they learnt to use electronic hand-held devices and capture field data. Significantly, data related to 38 trials and 4 nurseries were uploaded in just one week, giving a boost to the work on important crops for the semi-arid tropics – chickpea, groundnut and common bean, specific crops under TL III project and sorghum and finger millet under HOPE II project. 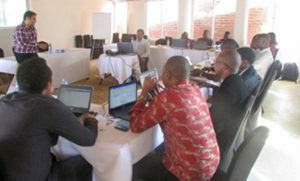 It was task time at Lilongwe as participants at this workshop spent time migrating data into the BMS and exploring advanced features including field maps, barcode label and electronic data capture using tablet devices. Staff from ICRISAT breeding programs in Ethiopia, Kenya, Malawi, Mali, Niger, Nigeria and Zimbabwe, besides staff from two Indian Council of Agricultural Research (ICAR) institutions – the Indian Institute of Millets Research (ICAR-IIMR), Hyderabad and the Indian Institute of Pulses Research (ICAR-IIPR), Kanpur, participated in the workshop. An innovative two-day ‘hackathon’ encouraged ICRISAT staff in Africa, to bring high quality research datasets to open access under FAIR (findability, accessibility, interoperability and reuse) principles, The result – nearly 35 high quality datasets from across Ethiopia, Kenya, Malawi, Mali, Niger, Nigeria and Zimbabwe were submitted to ICRISAT open data repository with CGIAR core metadata standards. These datasets are now available as global public goods. This is part of a series started at ICRISAT headquarters in India for organizing data and capacity building of the CGIAR Platform for Big Data in Agriculture. The workshops and hackathon were conducted by the Statistics, Bioinformatics and Data Management unit of ICRISAT, led by Dr Abhishek Rathore, Theme Leader.